Hey, y'all! 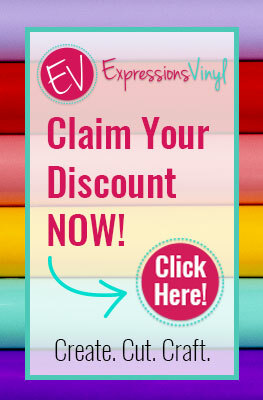 A few weeks ago, a blog friend contacted me about participating in a handmade ornament blog hop. I jumped at the chance because I love Christmas crafting, and making ornaments is one of my favorite Christmas crafts. 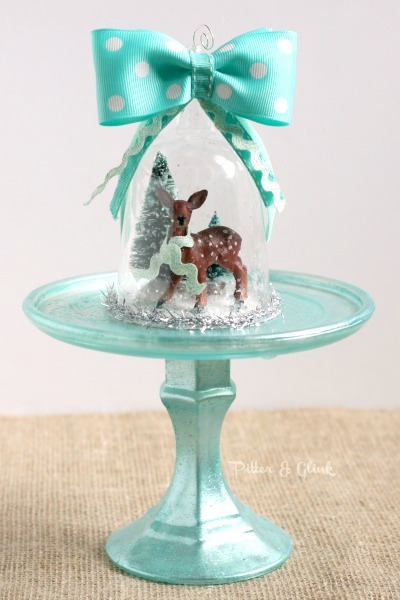 After getting some dollar store inspiration, I whipped up a deer snow globe ornament that I want to share with y'all today. And if you'll hang around until the end of the post, you can see lots more inspiration with links to over thirty other handmade ornaments from some very talented bloggers! But for now, back to my handmade ornament. I love vintage ornaments, and I thought it would be fun to try to recreate that vintage Christmassy look when making my ornament. 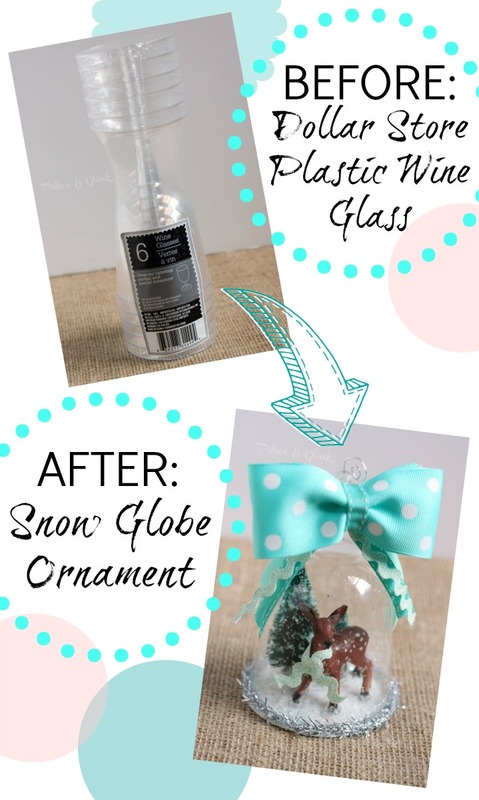 I've seen a couple of people make snow globes and cloches out of plastic cups and glass candle holders, so I decided to try to make a snow globe ornament myself. I found the material for the perfect "globe" at the dollar store. Plastic wine glasses! That's right, y'all. 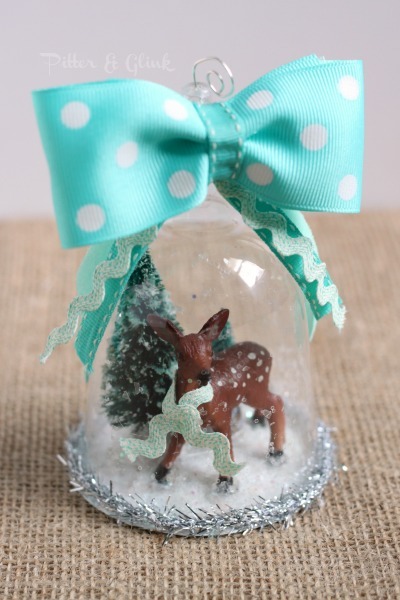 The glass part is perfect for a cloche or snow globe look. All you have to do is separate the bottom of the plastic glass from the top. 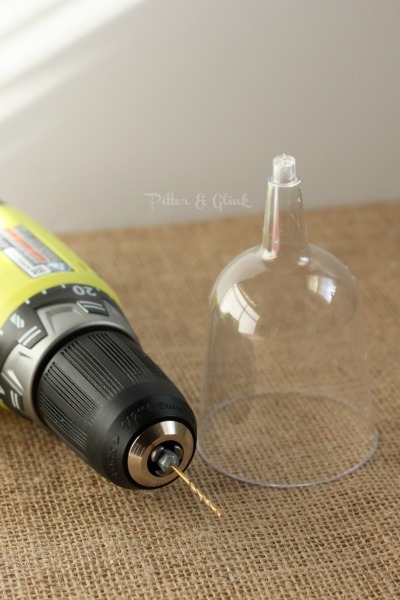 Drill a hole in the stem part of the glass. Thread an eye pin through the hole and create a loop at the top. The cloche or globe part of the ornament is then complete, but I needed something pretty to go inside the globe. I decided to create a little woodland deer scene. I found a jar in my craft stash that was a just a little larger than the bottom of my new plastic cloche. I traced it on a recycled box and cut it out. I painted the circle with several coats of white paint. 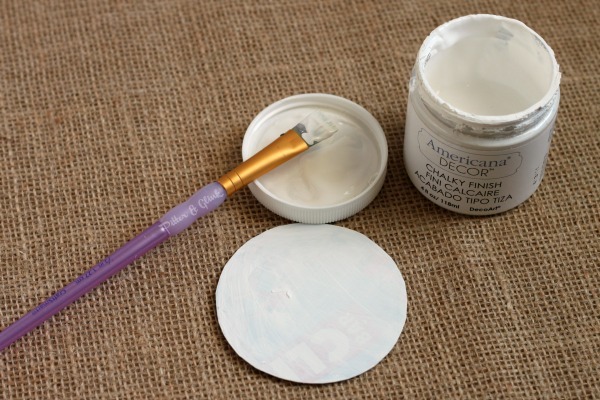 I coated the circle with sparkle Mod Podge and sprinkled different types of snowy glitter on top. 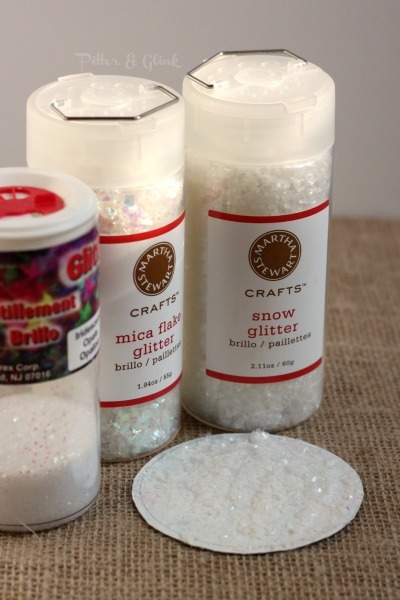 I actually did a couple of layers of this to make sure I had LOTS of glitter. 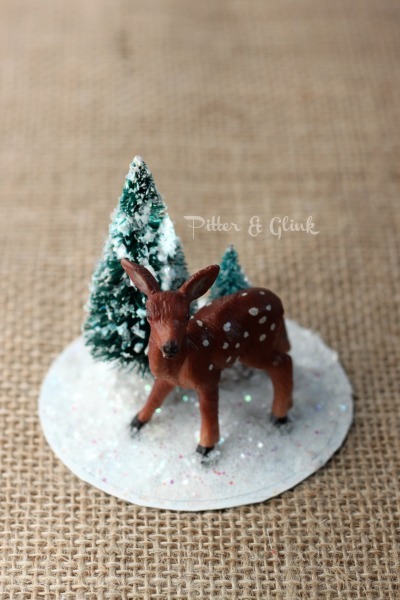 I used hot glue to attach two tiny bottle brush trees and a tiny fawn to the glittered circle. I made sure to sprinkle glitter on top of the hot glue to help camouflage it. 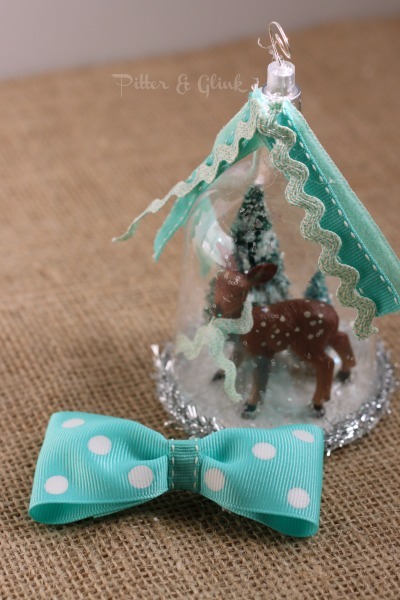 I also put a little sparkle Mod Podge and snowy glitter on the trees as well and glued a small piece of trim around the deer's neck to give him a little tiny scarf. I sprinkled extra glitter on the entire scene, deer and all, and I used hot glue to attach the plastic cloche to the base that I created. Then I used hot glue to attach tinselly trim around the bottom of the ornament. And because I always think more is more, I used hot glue to attach a few pieces of trim and a big bow to the top of the ornament. I LOVE how my ornament turned out. It looks great hung on a tree or displayed on my dollar store cupcake stand. Who would guess that this lovely vintage-looking ornament started its life as a plastic dollar store wine glass?! 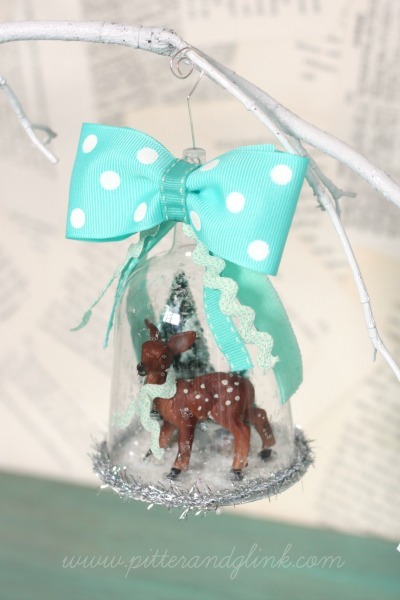 And now for the lots more handmade ornament inspiration! 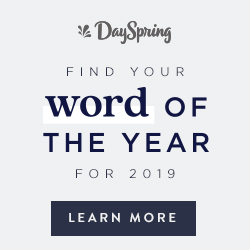 Check out all of these fabulous ideas from my bloggy friends. I love your snow globe ornament. It's clever. You are awesome. 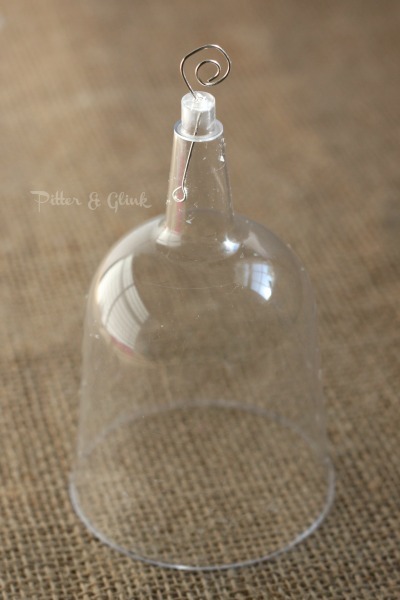 I've made these before with Sunday School classes and clear plastic cups, but your plastic wine glasses and big ribbon-- take them up a couple notches! Wow! So cute! I love this! 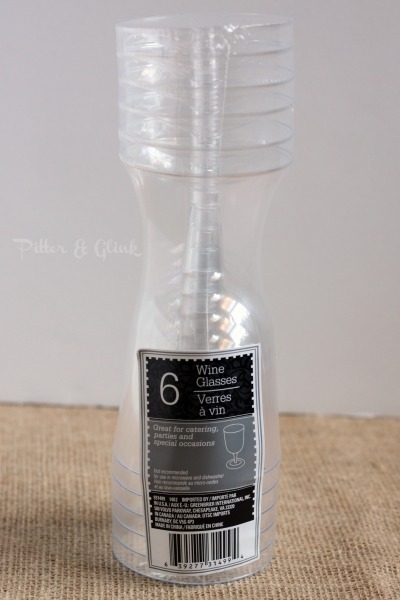 You were so clever to think of using dollar store wine glasses to make these. Yours looks vintage, a look that I love. I love these! I really need to start on the Christmas gifts. And these little ornaments are just soo cute! OMG! Bethany...that is the most adorable ornament. Cute! Cute! Cute! Adorable, Bethany! The little scarf was the perfect idea. Love this! So inspiring. 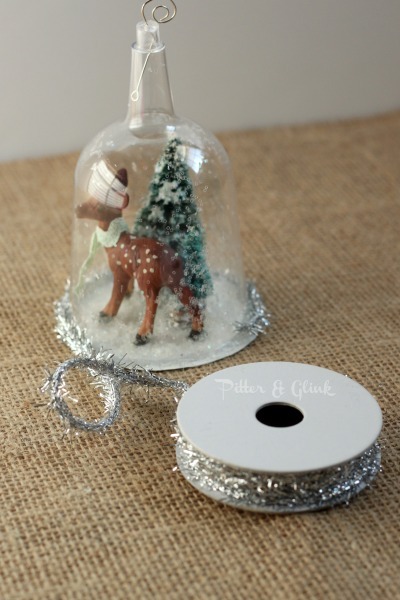 Simply easy and festive decoration. This is fabulous! You are so creative!! Bethany you rock! This is such a cute ornament, and I can't believe you did it with plastic champagne glasses from the dollar store! LOVE! 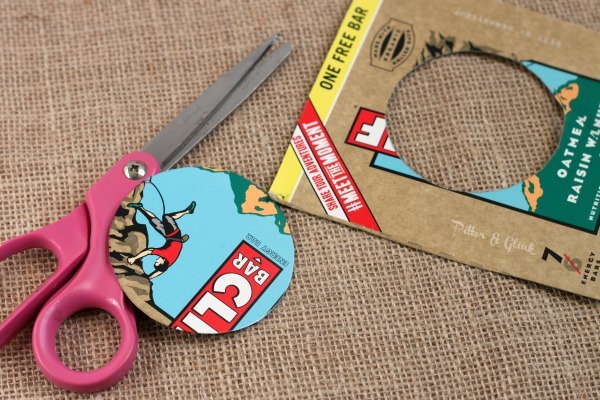 Oh this is such a cute idea! Thanks for sharing on Create & Share!!! Really cute! Where did you find the tiny trees and deer? Last year I was looking for a tiny deer for my cloche and could not find anything the right size. Thanks, Susan! The tiny trees and the deer came from the craft store. (Michaels I think.) I hope you're able to find some for your cloche.